Inspired by Streetfilms Bike Vs Car Vs Transit, the Car Free Days family took a challenge of their own: Bike Vs. 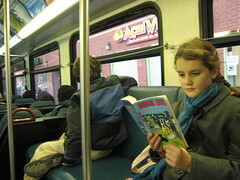 Bus from our house in Ravenna to Westlake Park in downtown Seattle for a little holiday in the big city action. In our hearts, Tim and I knew this wasn’t much of a challenge, having beat our four-wheeled friends home from restaurants, pubs, and stores. And we know that buses, with all of the waiting and stopping and loading, aren’t known for door-to-door speed. But, biased as we are toward two-wheeled transport, we still wanted to test our theory. The kids got into it: interviewing and polling bystanders on their opinion of the outcome. Family members (the bystanders) were asked to predict which mode of transport was faster. All members of the Car Free Days nuclear family voted Bike (go figure). Aunt Gail, (Booo!) voted bus. We set out from our North Seattle neighborhood at the same time. (The kids and I actually left a little before Tim – this was totally fair, as walking with 2 kids can sometimes be a slow process). Tim caught us as we approached the bus stop and kept on going. We, on the other hand, waited at the bus stop for a bus that never arrived. We waited and waited and waited, and the kids got more and more discouraged. They really wanted to win…and waiting for the bus was not part of the plan. The kids quickly figured out that we were NOT going to win. And they were really bummed. Disappointment quickly turned into frustration. “It’s not fair! Daddy is going to win and we are going to lose”. Where was the bus? We ended up waiting at the bus stop for 30 minutes. The bus we set out to catch never did materialize and we ended up taking the next scheduled bus. We called Tim to let him know that he could claim victory and to meet us 30 minutes later than planned. Out of breath and already in South Lake Union (despite a mega headwind) when we called, Tim was a little bummed that the challenge would end this way. He really wanted a race to the finish and this was a tad anti-climactic. Though he always knew the bike would be victorious, he didn’t want to win via a Metro-forced forfeit. We plan to try the race again one day when buses are more on schedule, just to prove without a doubt that bikes are truly still faster. Any one want to join us? 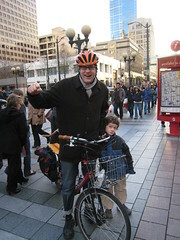 This entry was posted in bikes, extravehicular activities, seattle, streetsblog and tagged Bike Vs Bus Challenge, bikes, bus, metro, Race, seattle. Bookmark the permalink. Excellent contest. Sometimes it is hard to give a bus a fair contest. That, and the much greater freedom to go where you want when you want make riding a bike a pretty simple choice for me from a convenience and efficiency perspective. I’ve raced a bus before. Have to hope that it catches the lights and loads and unloads lots of passengers at it’s scheduled stops. Actually, that was a fair race– It definitely points up that when one takes public transport, one is at the mercy of the public transport. And one of those things that we can’t do anything about is exactly what your family experienced– a bus that doesn’t show up on time or at all. I would like to say that I would gladly catch the bus but besides on days when I feel like just hanging around and zoning out I’d actually rather walk. But how can any free spirited cyclist ever chose a bus over bicycle? Even if it took longer it would be hard to give up the freedom of a bicycle to be subject to the rout and schedule of a public bus. However, where I live, the fact is that most places can be reached quicker by bicycle. And it’s fun and I get to choose which way I go… and I get to stop whenever I see something interesting, and the bus doesn’t stop on the side of the rode when I see someone I’d like to talk to! I’ve been a life long cyclist, but there’s plenty of situations where the bus makes a better option. This “race” was flawed from the beginning. Did you use any bus-tracking services? Busview.org or any phone apps that let you know where buses are in real time? Using these tools I never wait at the bus stop for more then a two or three minutes, they make a world of difference. I agree, the bus does make more sense at times. While bus tracking can save time waiting at the actual stop, it doesn’t do you any good when you have to be some where at a specific time. If your bus is late, you’re going to be late. There’s something to be said for leaving when you want and arriving at a predictable time. Barring flats or mechanical failures, the bike will usually win. Well we are glad we could be some sort of inspiration from our film! BTW: I will likely be in Seattle in early February to take a tour of the Seattle Light Rail and maybe ride a bike for a day or two. Sounds great. Are you coming for an event that we should watch for? Shoot us a mail if you have time in your schedule for a coffee/ride. I’ve raced the bus before, too. The people on the bus always expect you to keep them waiting – the first time you race.